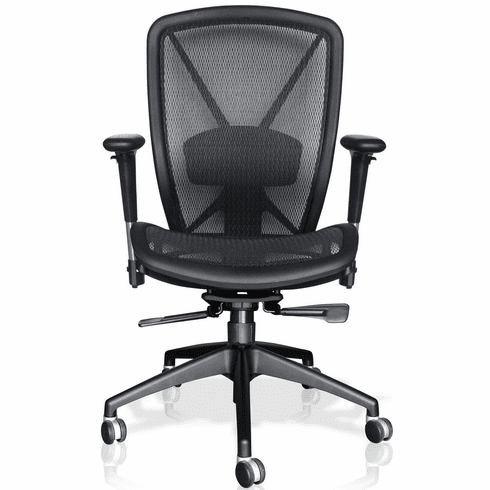 The Allseating Fluid Mesh Office Chair  - Free Shipping! The Fluid mesh back desk chair from Allseating features a highly engineered mesh backrest that controls stretch and distributes body pressure evenly to maximize air circulation and eliminate heat build-up. Other features include a thick foam padded seat cushion available in your choice of fabric or vinyl upholstery, pneumatic seat height adjustment, 360 degree swivel, tilt with tilt lock and tilt tension control, back height adjustment, adjustable height and width task arms and a heavy duty angled base with dual wheel carpet caster. Optional seat slider that allows seat depth adjustment available for a minimal charge as well as lumbar plus system (shown in main picture). Rated for users up to 325 lbs. Meets or exceeds ANSI/BIFMA standards. *Chair is shown with an ebony mesh 10B back and ebony mesh 10B seat in the main picture. Chairs are the right both have the cobalt mesh 20B seat and cobalt mesh 20B back. Dimensions: Back Size: 23"H x 19"W. Seat Size: 20"W x 19" - 21"D. Seat Height Adjustment: 16" - 19.5"H. Overall: 38.4" - 42.4"H x 28"W x 28"D. 10 year warranty from Allseating. This Fluid mesh office chair normally ships in 4 business days from Toronto CA.